With more than 26,000 locations nationwide and thousands more around the globe, Subway ranks as the world’s largest restaurant chain. Despite its size, though, the sandwich giant has shown some signs of decline recently. 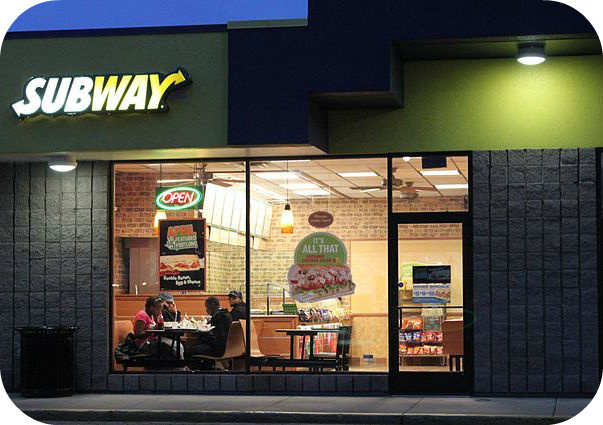 Along with three consecutive years of falling sales (including a 4.4 percent drop in 2017), foot traffic in Subway restaurants has plummeted by 25 percent since 2012. In fact, insiders estimate that as many as one-third of the company’s locations are not profitable. To combat this slump, last week Subway announced that it will close approximately 500 U.S. stores. These shuttered restaurants will join the more than 800 locations that the chain closed in 2017. Along with closing stores outright, Subway is also planning to relocate more than 1,000 restaurants in an effort to make them profitable again. For the last few years, the chain has faced increasing competition from newer operations like Panera and Au Bon Pain as well as old rivals like McDonald’s. Industry analysts say that Subway’s reluctance to redesign its restaurants and changes in consumer tastes have led to its recent downturn. “We aren’t eating the way we used to, and luncheon meats are just not what most people are clamoring for,” said Bob Phibbs, CEO of a consultancy company called the Retail Doctor. And similar to what we saw with 7-Eleven this week, Subway’s franchisees have long been upset with the company for its focus on adding as many new stores as possible. The company’s CEO Suzanne Greco tried to ease these tensions last week by admitting that “we focused in the past on restaurant count. We’re focused now on strengthening market share.” This appeared to set the stage for a new overall strategy at Subway, but then suddenly Greco retired from her position as chief executive yesterday. The company’s head of business development will take over as interim CEO, although only time will tell how this change at the top will affect Subway’s plans to fix its current problems. What are some of the causes of Subway’s recent decline? What do you think the sudden resignation of Subway’s CEO says about the current state of the company? Sources: Leslie Patton, “Subway Plans to Close 500 U.S. Stores, Build Global Reach,” Bloomberg, April 25, 2018; Abha Bhattarai, “‘it’s Just Not What People Want Anymore’: Subway to Close Hundreds of U.S. Stores,” The Washington Post, April 27, 2018; Kate Taylor, “Subway Is Closing Another 500 Stores — Here’s Why,” Business Insider, April 26, 2018; “Subway CEO to Retire 3 Years After Taking Over From Brother,” Associated Press, May 3, 2018. Photo by Dwight Burdette.